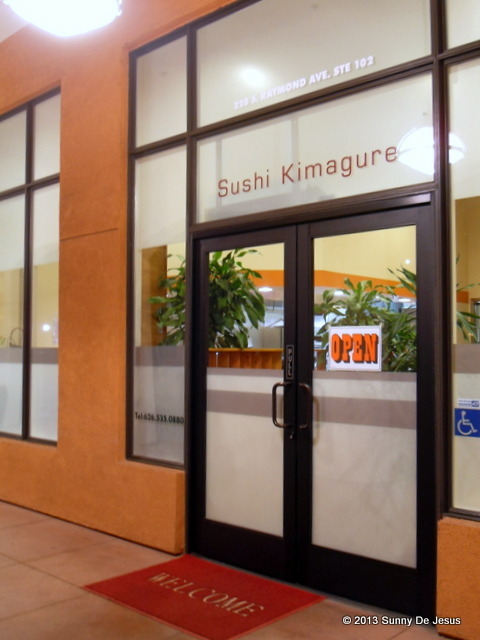 Pasadena’s Sushi Kimagure is perhaps one of the most unassuming places to eat sushi and I kind of like it this way. The outside entrance is unassuming. The decor is just as unassuming as well. Don’t expect that this sushi bar has a full bar and those large TV screens that funnels football, baseball, or basketball either. It ain’t a sport bar nor is this place an Americanized sushi bar that serves those monster-sized sushi rolls like dynamite rolls and spider rolls. Oh, no! You won’t find any of it at Sushi Kimagure. 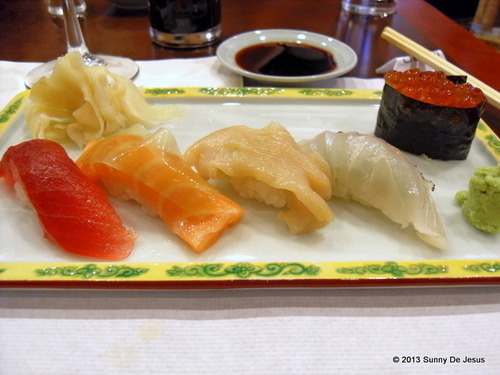 Instead, you’ll find that Sushi Kimagure is like the small traditional, old school sushi bars in Japan. 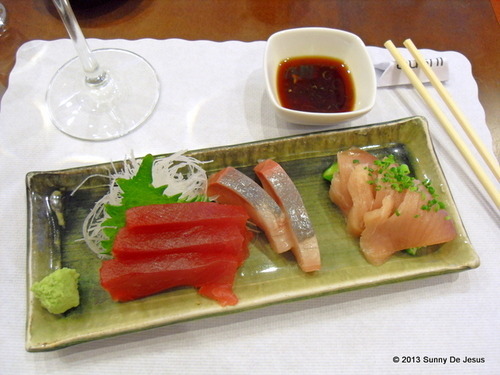 As a matter of fact, I noticed that Japanese Expats and Japanese tourist dine at Sushi Kimagure for the sushi dining experience that reminds them of home. The atmosphere at Sushi Kimagure is low key so expect the peacefulness of a quiet restaurant, because everyone is very serious about eating sushi and by being quiet, you show your respect to the Chef and the sous chefs for having intricately prepared a fabulous meal. 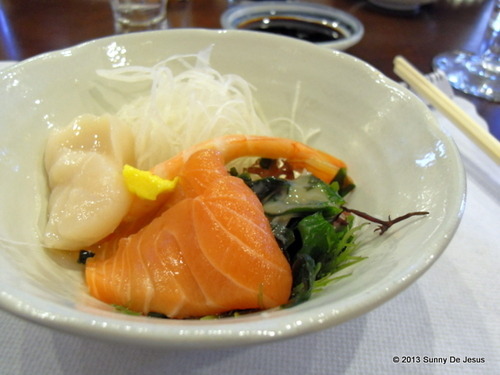 As for the menu at Sushi Kimagure, it is simple yet pricey. But you’ll soon find, like I did, that it was worth paying triple digit dining bill for the best Japanese dining experience and the best quality seafood. It’s really good to know that you can only order sushi a la carte with a minimum of 6 pieces. In other words, if you want Red Snapper (at $3 per piece), it means you would have to order a minimum of 6 pieces per person. From the looks of it, the sushi menu prices varies from $2.70 to $8 per piece. 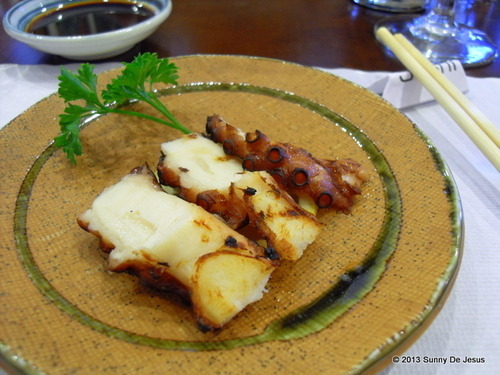 There is also a selection of market price sushi like squid, Spanish Mackerel, Uni (my favorite! ), and Sweet Shrimp. However, my friends and I specifically came to dine on the prix fixe Omakase menu, which is the “Chef’s choice” menu. 1. The $65 Haru Omakase. 5-courses. 2. The $85 Matsu Omakase. 8-courses, which includes one grilled item. I opted for the Haru Omakase, after dinner, however, I soon realized that I should have gotten the Matsu Omakase. Having seen the extra courses served with the Matsu Omakase, I concluded that they were extra dishes I would have loved to have eaten. Nonetheless, I enjoyed every bite of each course from the Haru Omakase. 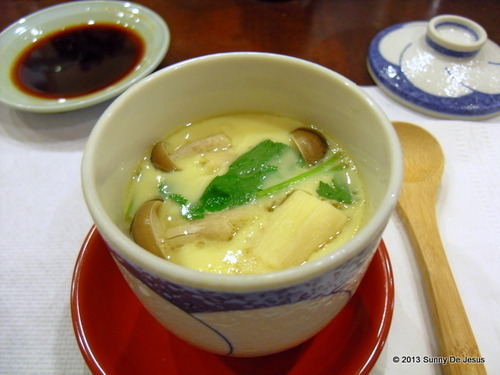 The hot savory egg custard soup is perhaps the most unique of the Haru Omakase menu. It was hard to believe that this tiny teacup sized portion was bursting with flavor. I also loved eating every single piece of sushi and sashimi. They were, indeed, the best that I’ve ever eaten. The taste was clean and bright so you know it was fresh. Also, the texture of each piece of fish was soft and subtle that it melted off your tongue just like butter. I truly enjoyed watching the Ike-San and his Sous Chefs watch us eat as hey were timing the preparation of the next course. I especially liked how the servers instructed us on how to eat each course of the Omakase. “You eat this piece with this sauce and you eat that piece plain.” It’s nice to learn the traditional way of eating sushi or how Ike-San wants you to delight your taste buds. Of course we ate as instructed to show respect to the chef. In the end, my friends and I had a wonderful dining experience having eaten the best sushi from the venerable Sushi Chef Ike-San. I coincidentally ended up having my two pieces of Uni without having to order the 6 piece minimum either. Why? Because I had already ordered an Omakase. Boy, I was so glad I asked. Previous The Best New Vegan Restaurants In L.A.